I received an email from a former student stating that she had selected several photos from the Organizer of PSE 12, edited them in the Edit mode, saved the edited version (not using a Version Set), closing each image, and then returning to the Organizer. The problem is that generally only one of the edited images was in the Catalog. I have not experienced this in using PSE 12, nor any version of PSE that I recall. Normally, I do not work with multiple images open in the Editor, unless I am going to combine them in some way. So I decided to essentially duplicate her steps. I was surprised by what I found. I selected four images in the Organizer and opened them in the Editor. One at a time I made a change to each image and then saved it, not selecting to use a Version Set, as is my usual practice. I was surprised and upset with the results. Three of four images I edited were shown in the Organizer’s Catalog as expected, right next to the original version. The fourth one was not. 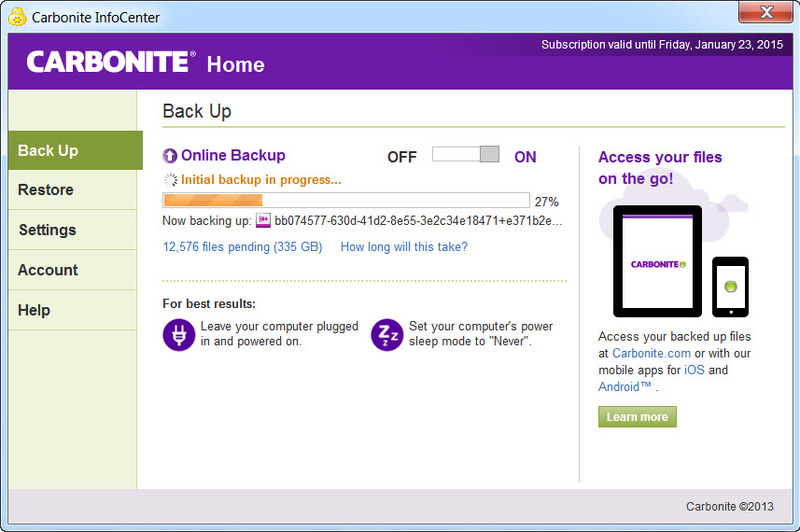 It had indeed been saved and was in the designated folder. Also, back in the Editor, I could load it again via File > Open Recently Edited File. It just was not in the Catalog. Worse yet, when I tried to Import it again from its folder, I received the standard message saying nothing was imported, because the image was already in the Catalog or it was the wrong etc. To make sure the file was indeed ok, I changed its name and it then imported fine into the Catalog. I went to the Adobe Forums and found this thread. It turns out that others have experienced similar problems. It seems the Auto Analyzer and/or using a Catalog converted from an earlier version are related to the bug. I do not know much more than that now. I do not use the Auto Analyzer and have its option turned off in the Preferences. I also recommend this setting to my students as well, but for different reasons. In the past, my PC took a noticeable performance hit when this option was turned on. 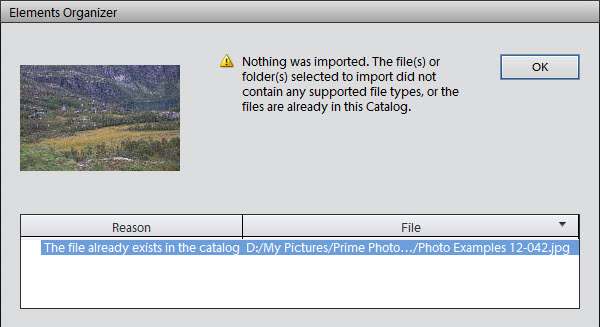 To the best of my knowledge, I have not experienced this problem using my single picture editing workflow using Version Sets. But I am going to be much more watchful now. If you are considering up grading to the latest version of Elements, you will probably not find a better price at any time than what Costco is offering now. 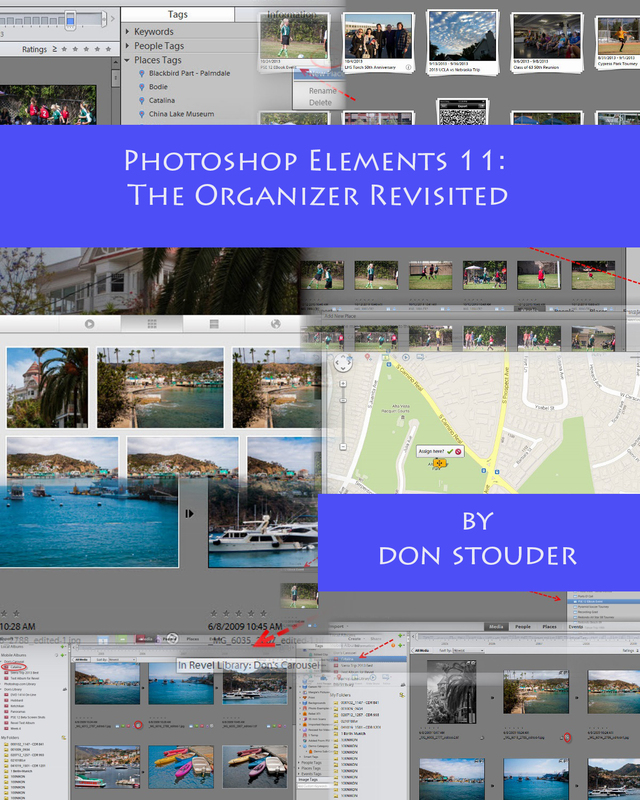 Some of you may know that I wrote and published an eBook, Photoshop Elements: The Organizer” about a year or so ago. It essentially covers the Organizer in all versions of Elements up through PSE 10. It is still available on Amazon. Adobe drastically changed the look and feel of Elements when they released PSE 11 last year. During the summer,I began updating the eBook for PSE 11, and just completed it. As they have consistently done, Adobe released PSE 12 about a month ago. Fortunately for me, the user interface of the new version is virtually the same. My eBook is based on PSE 11, but I did include a bonus chapter at the end that overviews the significant changes in PSE 12’s Organizer. Both books cover only the Organizer, because I feel it does not get nearly the coverage it should within the many other books that have been written on Photoshop Elements over the years. If you would like to take a look at it on Amazon, Click Here. Let me know in the comments section below what you think. Thanks.